Earlier we posted few DIY car repair techniques. This article is about DIY home repairs that can save you money, give you personal satisfaction and let you learn new skills. For my watching YouTube videos to fix a few things really paid off. We could save money on putting a new shower head, fixing the fuse and setting up the patio net among some other stuffs. Home maintenance should always be done all throughout the year. Otherwise, you may find both financial difficulties and household issues in future. By regularly maintaining the house ranging from its foundations up to its roof, you will be able to live peacefully and with lesser worries. You might argue that home maintenance is not budget friendly. Well, here is a list of 51 tips for a do-it-yourself home maintenance that fit any budget. And, when you compare these against the cost of hiring an expert, I must say the cost of DIY is more than 50% lesser. At least, my experience tells that. 1. It is extremely important to prevent any crack or gaps in the foundation. You can simply use a caulk gun and cover those cracks as soon as possible. 2. You can use forks to unblock the air conditioning system for quick maintenance. By unblocking, you can easily drain the faucet of the system. 3. The air conditioning screen should always be checked from any debris to make sure that air can flow efficiently. 4. Add food coloring to the toilet tank’s water. If the water in the toilet bowl changes, then, you have a leak. 5. In a bathroom, a hair strainer is necessary to guarantee that hair-caused clogging will be prevented. 6. Shower heads can be cleaned using pins or be soaked under vinegar for a few hours. 7. To fix a leaky faucet, you can simply unscrew the faucet handle and replace the rubber washer inside the handle. 8. You need to avoid spilling oil and fats in the sink. If accidentally done, then, run it with hot water together with dish soap. 9. Never use acids to fix a clog. The strong chemical may lead to plumbing leakage. 10. Damping vinegar in the sink is a good way to sanitize the sink. 11. Always turn off exterior faucets. 12. A plastic supply lines of the washing machine should be replaced every three years. A rusty metal end of the water supply lines means that replacement is necessary. 13. Similar to the water supply lines, if you found the metal end of the washing machine’s drain hose rusting, then, the hose should be replaced as soon as possible. 14. Remove the lint of the dryer from the screen after each laundry. This will keep the lint efficient in regulating the heating system, preventing the machine to overheat which may lead to fire. 15. The residue of the fabric softener should also be removed from the dryer by simply washing the screen with dish soap and water once a week. 16. 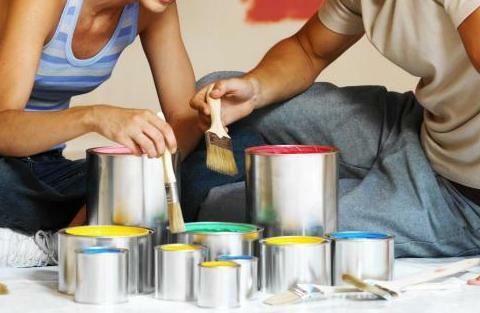 You can add vanilla to your paint to remove any odor such as smoke from the wall. 17. Lemon peels can be thrown to garbage disposal to remove bad odor. 18. Make potpourri using orange and lemon peels. 19. Burning incense inside the home can remove bad odor. 20. Baking soda can be used to lessen the bad odor of garbage. 21. Spray perfume on a light-bulb before lighting it. 22. Try to grow herbs in the kitchen to freshen the smell. 23. Put a paper between the refrigerator’s doors and try to pull it. If done easily, then, the door seal quite loosens and needed to be fixed. 24. Keep as many items in the refrigerator to lessen the amount of energy it consumes. 25. Always check gutter leaks. 26. Clean the gutter everyday by sweeping all debris such as leaves. 27. Look for roof pieces on the ground to see if there were damages during storms. 28. Check the roof right after a storm. 29. Sweep dried leaves on the roof to prevent a gutter clog. 30. Put extensions to the gutter downspout. 31. A garage door can be tested for reversal after hitting an obstruction. 32. Batteries of smoke detectors should be replaced every year. 33. Unplug appliances not in use. 34. The garden can be maintained by pruning trees and removing dead branches. 35. It is best to varnish the garden fence or repaint any garden furniture at the end of each year. 36. Lemon peels can be scattered around potted plants to prevent cats from digging the soil. 37. Use fruit leftovers as fertilizers for the garden. 38. Cut or crush dry leaves for decomposition. 39. Orange fruit peels can be added to sugar containers to prevent ants. 40. Avoid accumulation of water in the kitchen. 41. Immediately find the source of termites. 42. Use orange potpourri as a pesticide against ants. 43. Use baking soda to clean wall stains. 44. Check window caulk for cracks. The cracks leaks energy outside, be it the inside heat or cold temperature. 45. Firewood should be kept 18 meters away from home. You can take a week-end morning to move the logs out, if they’re not. 46. Water from the gutter should be pouring 3 – 4 meters away from the foundation. 47. Put items that are not used in a garage sale. 48. Use multi-functional furniture to maximize space. 49. Mount racks for walls to save space. 50. Give away old magazines and newspapers. 51. Keep all things in proper place to avoid clutter. All these DIY tips for home maintenance will save you from spending too much for repairs and replacements in the future. Just while editing the article for the last time, I did went out and fixed the toilet clogging by watching this video. Now readers, be inspired and fix something at your home. There must be something waiting to be fixed. You could add one more tip under “Technologies and Gadgets”: Avoid placing electrical appliances in stand by mode as they consume energy while they are in standby mode. I didn’t know that you could use potporri to deter ants. I’ve read that borax is good as well. My DIY home repairs have mostly been limited to caulking and and attacking mold with bleach. 🙂 Good tips! I’ll have to bookmark this list for when I actually get a home. Until then I will let the maintenance people at my apartment worry about all this stuff. I guess these are the perks of living in an apartment. Do you put the it on the floor or something to deter ants? My grandmother would love number 36. These are some great ideas. However, the first one should be done with a word of caution. I attempted to fix some cracks in my brickwork with masonry caulk. It helped for about 5 years, but the crack slowly spread. I had to hire masons to fix the problem. They said I had the right idea, but it acted like a band aid and was only temporary. You can use a combination of vinegar, baking soda, and water to clean the oxidation off the AC heat exchanger. Just be careful of the delicate fins. Only use a mist setting on the garden hose to wash off the cleaning solution and debris. Just what I need, We’re moving two weeks from now and this one is perfect tips for us. Thanks a lot.. Very helpful indeed.. Thanks Tina, glad to be of help! This is a very useful article to read! You must be very handy to have such a vast knowledge on how to maintain your home with these helpful tricks. Keep up the good work! For great results every time, I always use products provided by NuGrout. They offer excellent service along with quality products that give a long lasting impression. My clients are continuously impressed with a job well done. To check out more about what they offer, including their line of Pre-treat products.